WEST LAFAYETTE, Ind. — A pilot study of a new technology that lets students use Twitter and text messages during and after class has found that it increases student engagement and is used more often by higher-performing students. The technology, called Hotseat, was developed by Purdue University in 2009 to increase student engagement in large lecture classes. 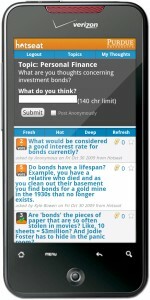 The application allows students and instructors to use smartphones or laptop computers to send messages during or after class. 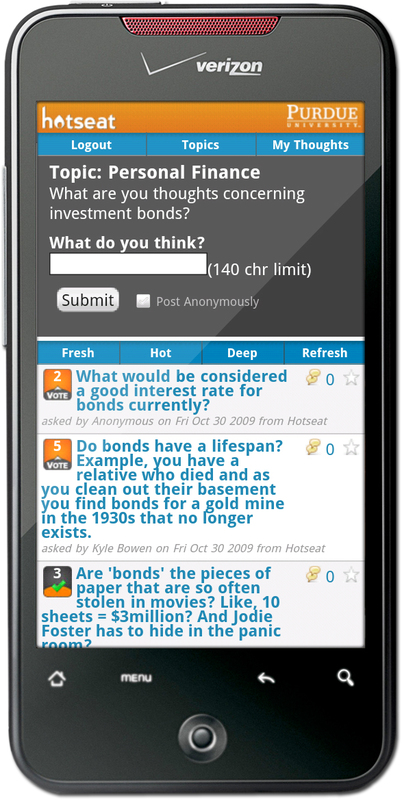 Other students can vote to rank the messages and respond to the discussion. Hotseat was tested in a pilot study during the spring 2010 semester. During the study, more than 2,000 students sent more than 38,000 messages using Hotseat. Classes using Hotseat included courses in family development, finance, human sexuality and biology. Kyle Bowen, director of informatics at Purdue and lead developer of the tool, says some professors use Hotseat to foster discussion during their lectures, and others use it for discussions following class. Unlike a regular Twitter account, the Hotseat discussions are restricted to just students enrolled in the class and the instructors leading the course. Students may post anonymously – 53 percent of the students in the pilot study chose this option – but who is actually posting is known to the instructor. “This prevents ‘content grenades,’ where a student intentionally tries to get the discussion off course,” Bowen says. Instructors also receive analytic data about how much students are posting and when. The research found that in two of the three classes the students sending messages the most were those receiving As, the students sending the second-most number of messages received Bs and so on, with students receiving the lowest grades sending the fewest messages. In the other course examined, students who received Bs sent the most messages. “Hotseat use tracks with the level of student engagement, and our survey found that it increases student engagement in the classes,” Bowen said. The interaction changes the experience of a large lecture class, says Hans Aagard, senior educational technologist at Purdue. 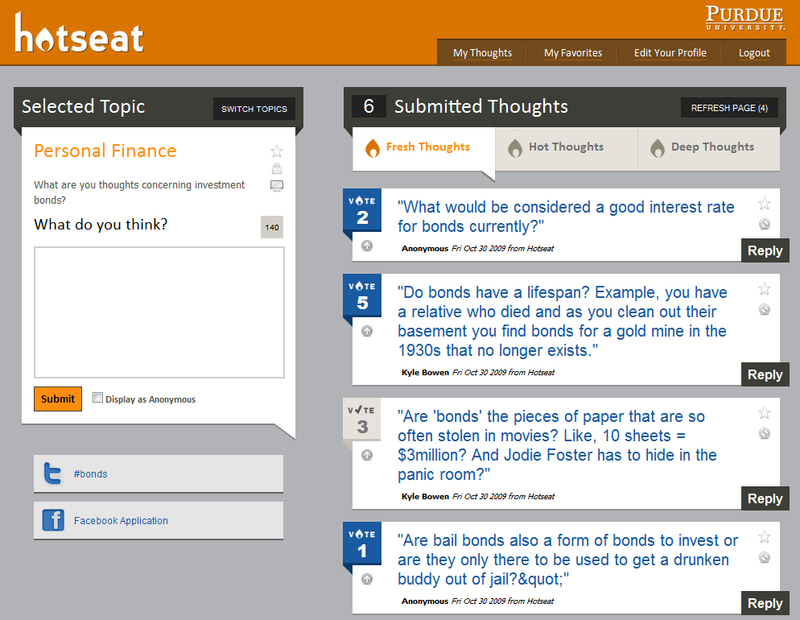 During the pilot study, students could only respond to Hotseat by sending Twitter or Facebook messages, or by logging into the Hotseat website. For this academic year, students can also send text messages to Hotseat. 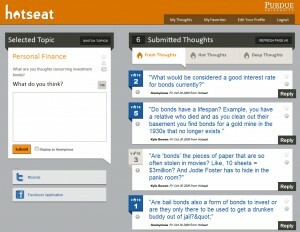 Purdue has made Hotseat available to other institutions via the educational software site FolioDirect.net.